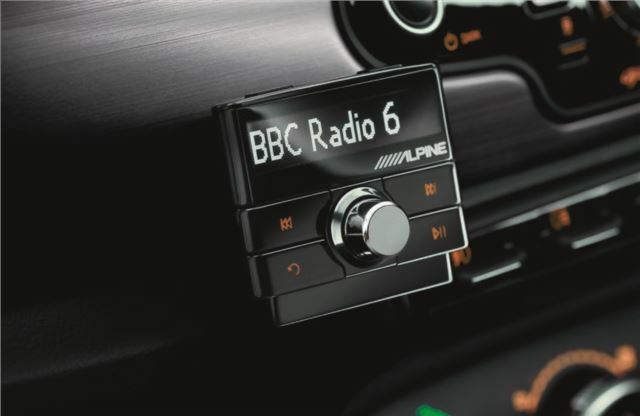 Alpine has launched a new DAB adaptor that can be fitted to almost any car providing digital radio as well as the ability to connect an iPod or iPhone. Designed in conjunction with Pure, the EZi-DAB costs around £250 which includes the window antenna. The good-looking unit has a minimal design and connects to any existing car stereo. It also has five different illumination colours - green, amber, red, blue and white - so that it integrates with the colour of the dashboard switches and controls. The iPod connection lets you search and play music through the car speakers and also charges the device at the same time. One of the cleverest features is the ability to pause and rewind live radio plus you can pause the radio for up to 15 minutes, even if you remove your keys from the ignition. It also has a dual tuner so you don't need to keep retuning as you drive.